The news of David Bowie's passing earlier this month shocked the entire band and the music community at large. When we got together for rehearsal and talked about it, we realized we each had a different favorite song and our own unique stories of how his music impacted our own musical development. While we mourn his loss, we were also so thrilled to be asked to participate in an upcoming tribute show where several District bands will play many of the Thin White Duke's classics and some lesser known numbers. 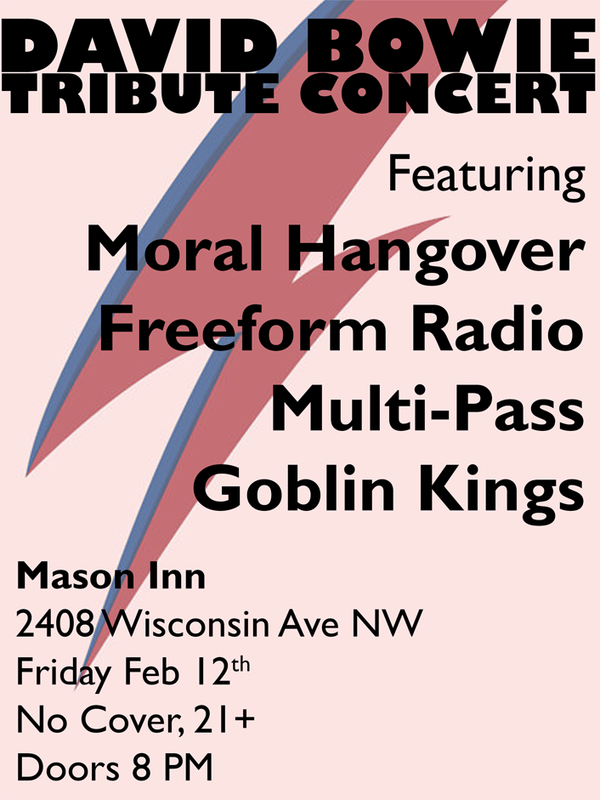 We will be joined by Moral Hangover, Multi-Pass and Goblin Kings, and the show will take place next month at Mason Inn. It's a free event. We've got our work cut out for us, no doubt. For our part, we're playing "Ashes to Ashes," "Starman," "The Man Who Sold the World" and "Space Oddity."